While homicide by firearm is typically justified in the United States if a person feels threatened with great bodily harm, Minnesota has an additional “duty to retreat” law. Justifiable homicide by use of a firearm is legal in most states under the Castle Doctrine which states that “a man’s home is his castle.” Under this doctrine, an individual has the right to self-defense if he/she feels threatened by great bodily harm, or is attempting to prevent a felony. In Minnesota, this doctrine applies to all individuals, but there is a “duty to retreat” law which states that a person must stop shooting once the threat is eliminated. If shooting continues, the shooter may be charged with murder under the duty to retreat laws. Self-defense becomes murder at a very specific point. In Minnesota, a person is allowed by law to shoot or even kill an intruder who breaks into his or her home and threatens the person with great bodily harm or death. However, the person must stop shooting when the threat is eliminated, even if the intruder is lying on the floor wounded and still alive. In some other states, self-defense laws go even further than Minnesota’s self-defense laws. These states have “stand your ground” laws, rather than “duty to retreat” laws. Generally, “stand your ground” laws allow people to respond to threats or force without fear of criminal prosecution. In “stand your ground’ states, a person has no obligation to retreat once the threat of harm is eliminated. According to the National Conference of State Legislatures (NCSL), 25 states currently have “stand your ground” laws. Most of these states are southern states, but specifics on the laws may vary from state to state and states may enforce the laws differently. Florida has the strongest “stand your ground” laws in the country. Florida’s law has drawn considerable attention over the years, most notably in the shooting death of Trayvon Martin, a 17-year-old killed by George Zimmerman in Sanford, Florida in 2012. Although Zimmerman was charged with Martin’s death, he was eventually acquitted under Florida’s “stand your ground” laws for self-defense. In 2012, the Minnesota legislature passed a bill that would make Minnesota a “stand your ground” state, expanding justifiable homicide by the use of firearms beyond a person’s home to his/her cars, boats, motor homes, even tents. Then Governor, Mark Dayton, vetoed the bill. That same year, a Minnesota man, Byron Smith, shot and killed two teenagers who broke into his home on Thanksgiving Day. The man told police that he was in fear for his life, even though he wasn’t sure they had a weapon. Police stated that the man seemed to brag about the finishing shot that killed both teenage boys, one 17-year-old and one 18-year-old. Smith admitted to police that he fired more shots than he needed to. The 64-year-old man was charged with murder, a felony offense, because he ignored Minnesota’s “duty to retreat” laws. How Common is Self-Defense with Firearms? According to the Pew Research Center, 48 percent of gun owners say they own a gun for protection. Depending on the people asked, some say they have used their guns in self-defense while others say they have never used their guns. Recent data from Harvard University shows that the majority of gun owners rarely use their guns for self-defense. Between 2007 and 2011, data shows that only 0.9 percent of gun owners defended themselves from harm with their guns. Researchers state that the exact number of gun owners who use their guns for self-defense is difficult to prove because most people who commit crimes and get shot in the process don’t go to the hospital for treatment. Criminals wounded by a gun used in self-defense have no incentive to go to a hospital emergency room, because medical professionals are obligated to report gunshot wounds to the police. There are no hospital records of injuries and no records of gunshot victims because most instances of self-defense gun use never get reported to the police. Although Minnesota and other states have “duty to retreat” and “stand your ground” laws that relate to gun use in self-defense, there are legalities that may play a role in these gunshot cases. For instance, if a person uses a gun for self-defense outside of his/her home, illegal possession of a firearm may impact the outcome of the shooting. Most states require permits to legally carry a gun. If a person does not have a carry permit and shoots someone, even if self-defense, he/she could face aggravated assault charges. 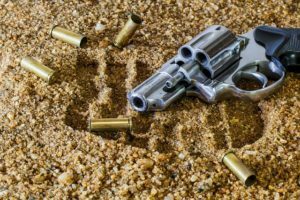 Understanding specific state laws related to justifiable homicide by use of a firearm can protect a person from being charged with a crime. Gun owners in all states should know and understand state laws related to self-defense.